Szábolcs Takács is the state secretary for EU affairs in the Hungarian prime minister’s office. He spoke to EURACTIV.cz Editor-in-Chief Adéla Denková on the margins of the Central European Expert Forum organised in April 2017 under the Polish presidency of the Visegrád Group. The Hungarian government claims that NGOs supported from abroad operate in Hungary in order to interfere in Hungarian affairs. Of course, this is a matter of national law and most NGOs play a very important role in a healthy and democratic society. However, there is a need for clarity on the activity of such organisations. We have to differentiate between NGOs which operate legally and openly strive to realise their visions and goals, and those operating in the shadows (whose) goals are unclear. Can you give an example of a non-transparent NGO? Italian prosecutors are leading an investigation of NGOs cooperating with illegal networks of people smugglers who try to bring more illegal migrants to Europe, which is motivating more people to try to cross the sea. These kinds of activities are those that we would like to stop. You say that the V4 should not be perceived negatively. But the Visegrád countries created a negative brand for themselves because of their position on the migration crisis or, more specifically, on the relocation mechanism. The V4 presented a very sensible proposal on how to tackle migration, and the proposal of the European Commission simply does not work. Look at the numbers. Out of the 160,000 people determined for relocation until September 2017, approximately 10% have been relocated so far. Is it because of Hungary? No. It is because the mechanism is not viable. The Commission refuses to acknowledge that. More and more governments in different member states have realised that if we cannot put migration under control, we are all lost. Last week, Germany and Italy came up with a proposal for an EU border control mission between Niger and Libya. We can support this because this is a sensible proposal. The EU has already adopted a number of measures to strengthen the control of the external border and tackle migration. But what should happen with those people who are already in Italy or Greece? If they are staying in Europe illegally, we have to send them back. The vast majority of them are not refugees, and everybody knows that. Even the vice-president of the European Commission said at the meeting in Malta that among those who are coming (via) the Mediterranean, the Syrians are not even in the top ten nationalities. They are obviously not refugees. They are people with economic aspirations. Have you increased your volume of development aid? In comparison to the size of our population, Hungary is more actively involved in international development, humanitarian aid and crisis management efforts designed to address the ongoing refugee and migration crisis. Hungary joined the donors’ pool of the Visegrád countries and disbursed €700,000 to the EU Emergency Trust Fund for Africa. Hungary offered €3 million for the EU Trust Fund for Syria, another €377,000 to the World Food Programme Syria; moreover, we made a €5 million pledge at the London donor conference for Syria. In the framework the EU-Turkey Agreement, Hungary will also contribute €14,661,360 to the EU Facility for Refugees in Turkey as of 2019. In addition to that, Hungary is concerned by the deteriorating humanitarian situation in the Horn of Africa, Nigeria, Yemen and Syria. 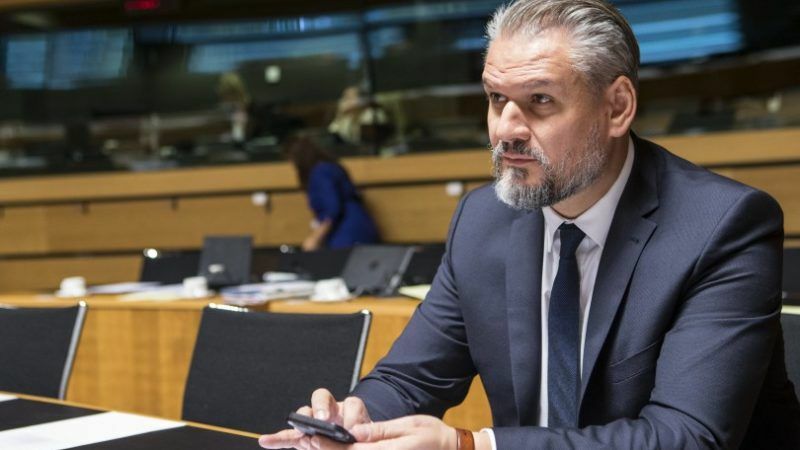 Hungary plans to raise its amount of support to the World Food Programme by €1 million as an earmarked contribution to its humanitarian work in South Sudan, Somalia, Nigeria and Yemen. Hungary claims that the Commission has overstepped its powers with the proposal for obligatory relocation quota. But in the end, the mechanism has been supported by a majority of member states. So now you are breaking the law, because Hungary has not taken part in the relocation scheme. At the European Council, European leaders reached a consensus that any relocation scheme can only be voluntary. It was the European Commission that breached the deal. We can see a lot of political motivation behind it, and that is why we say that the Commission has completely misunderstood its competences. They are going against the Lisbon Treaty, and this is not the kind of European cooperation that we believe in. On the other hand – as I already said – the decision on the relocation mechanism was approved by a majority of member states, so now it should be applicable. We consider the decision of the ministers of justice and home affairs from 22 September 2015 to be invalid and anti-democratic. That is why we have taken the issue to the European Court of Justice, together with the Slovak government. Let’s wait until it decides. In the meantime, we refuse to acknowledge that we are acting illegally. Let’s forget the legal issues. Does this all mean that Hungary simply refuses to take any refugees at all? Hungary is doing much more for the security of the EU than many other member states. We are fulfilling the Schengen code, which means that we have to defend the external borders of the Schengen area. Nobody is helping us – on the contrary, we have been (subject to) enormous, politically motivated criticism. We do not want a slap on the back in exchange for what Hungary has so far done for Europe. But we can only talk about a new asylum mechanism once these facts have been recognised and a truly honest debate has taken place between the member states on migration. There has been a lot of criticism from Brussels of Budapest. Not only because of migration but, for example, because of its attempts to close the Central European University (CEU. What is your interpretation of this criticism? We view the criticism, including the recent resolution of the European Parliament against Hungary, as politically biased, because we are taking a very strong line on migration. Is this just because of the migration issue? The CEU seems to be another case. If we talk about the CEU, we have modified our higher education law to ensure clarity on the Hungarian educational market. The CEU can operate in Hungary and issue Hungarian diplomas and degrees and will be probably able to carry on with that. On the other hand, institutions which only have a post box in the United States cannot issue American diplomas. The CEU would not be able to operate in a number of EU countries under the same conditions. The European Commission has some concerns (about) whether we fully comply with the EU and it has the right to start an infringement procedure, which actually happened. We have to answer the questions of the Commission by a given deadline and we will see whether we can convince the Commission that we are right, or if the Commission can convince us. If we cannot convince each other, we will go to the Court. But if you look at the number of infringement procedures against Hungary, you will see that we qualify for the better half of the EU member states, both in the number of infringements and the seriousness of these procedures. We are complying with European law much better than a number of other members. Just because we have different ideas in some cases – like migration – we should not be perceived negatively. This is exactly what we are fed up with. This hype is generated by federalist European politicians who refuse to give up their dreams about a federal Europe that cannot materialise. Some analysts say that the Hungarian government takes every opportunity to provoke Brussels to criticise it, because it can tell Hungarian voters that “the EU is trying to intervene in our internal affairs again”. That might be a useful message before the spring 2018 parliamentary elections. I do not think we try to provoke the European Commission to go beyond its competences. We believe that political guidance on major issues should be given by the Council. Its decisions must be adopted by consensus and everybody must accept the compromise that is reached. The Commission does not have the right to override it, but it tries to do that and we experience it in many sectoral policies as well. If a member state breaches the rules of the internal market, it has to face consequences and the Commission launches an infringement procedure. But we can see the application of double standards in a number of issues, which is unacceptable as well. European integration will not work unless everybody respects (each other). This applies both to the big and small member states. National interests must be respected. May be the V4 countries should consider leaving the EU and form their own grouping???? Outrageous idea? ?